From windy ridge (Mile 2132) facing out toward Mt St Helen's, Mt Rainier and Mt Adams to Cascade Locks (Mile 2155) on the Columbia River. Sean-o again. Impossible to do this stretch of trail justice in words. Pictures can only brush the beauty. Mt. Adams on the right, Mt. St. Helens on the left, and Rainier in the distant middle. 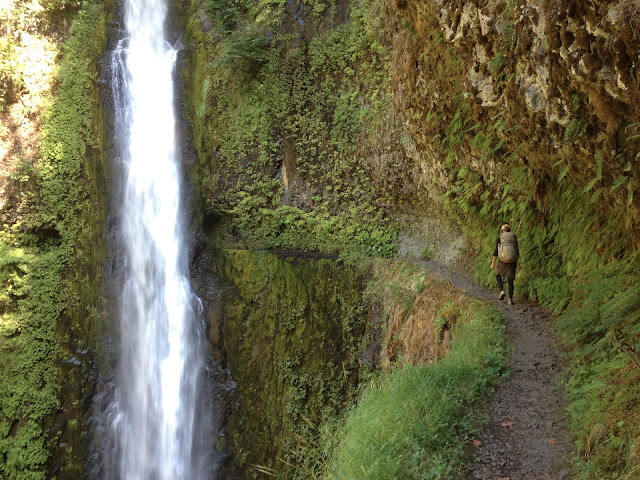 We took an alternative route, the Eagle Creek Trail, toward Cascade Locks, our last stop in Oregon. It was a fitting finish. We passed over multiple springs festooned with ferns and moss, each looking like a carefully designed display at a botanical garden. For much of the day we had the trail to ourselves but that gradually changed as we descended. Pan heading along the trail to Tunnel Falls. Dionysus and Seano at the Tunnel by the Falls. With Portland a mere 30 miles away, people were there in the dozens to take advantage of a lovely late-summer Saturday. 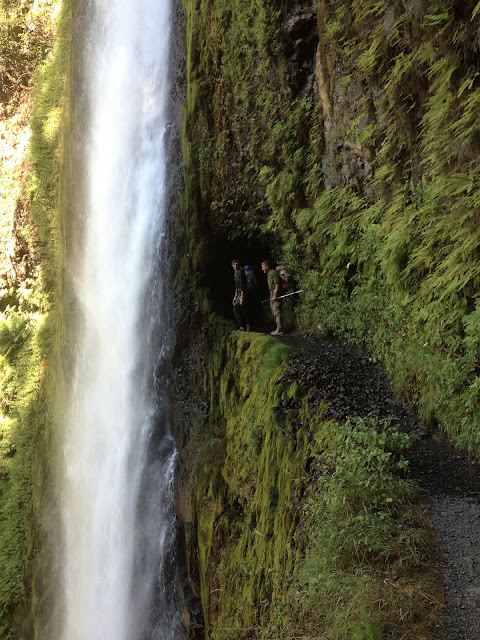 The highlight was Tunnel Falls, a roaring cataract that drops over the trail where a carved passage curves through the rock wall. 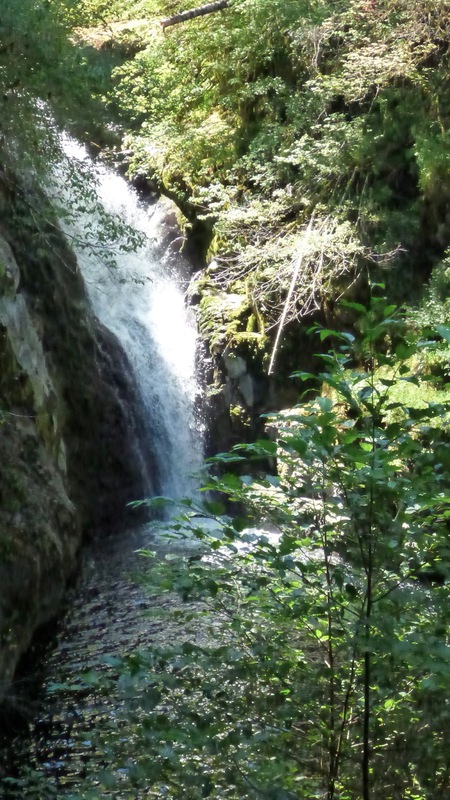 You can see all the photos but they cannot touch the experience of sound and wet and the sense of depth of the falls. There is wonder out here when we're not too weary to perceive it! We continued on toward Cascade Locks, bracing ourselves for a final 3-mile walk on a bike path next to the highway into town. Suddenly, a man stopped his car on the freeway, vaulted a railing and introduced himself--Jeremiah, a kindred hiker who had done the AT in 2006. 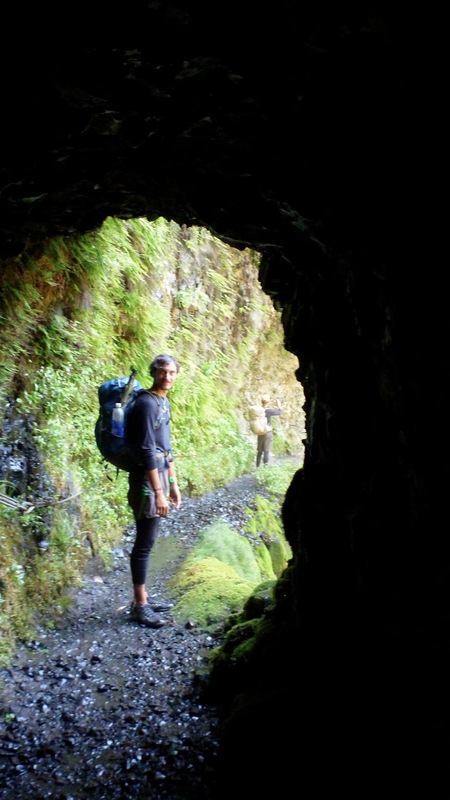 He loaded us - and our smelly gear-- into his idling Subaru and trundled us into town. We stayed in a very nice cabin at the Bridge of the Gods RV Park. Pan fixed spaghetti bolognese in the kitchen there and we drank root beer floats until we were full to bursting. It was carb-replenishment at its most comforting. Tomorrow will be devoted to resting, and assembling five boxes each of groceries to send to ourselves all over Washington. Tomorrow morning, Pan is fixing carbonara. Yay!